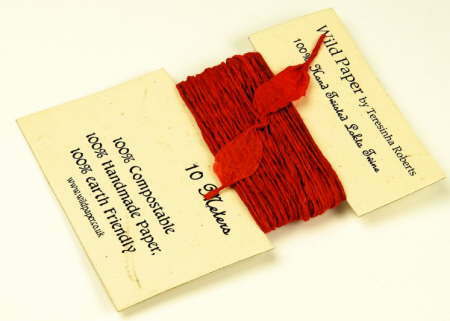 10 metres of Red and 10 metres of Black lokta paper string each made from a strip of thin lokta paper about 2 cm wide and hand twisted in Nepal to produce a twine that is 1-2 mm wide (Red lokta twine shown in photo). The string can be opened up to produce a variety of decorative effects as shown in the photo. Each 10 metre length of lokta paper string is supplied on a 15 cm by 10 cm paper card.